Born in Germany, Helmut Lipsky, grew up in Switzerland, where he studied violin with Concertmaster Abraham Comfort of the Winterthur Collegium Musicum Orchestra at the Zurich Conservatory in Switzerland, graduating with a bachelor and a concert diploma in performance and pedagogy. As a member of the Collegium Musicum Orchestra, he toured Switzerland and France, under the baton of, and accompanying the pianist Géza Anda. He then, at the age of 19, continued his studies in New York City, working for three years with Professor Ivan Galamian. Later he was a pupil of the international acclaimed violin soloist Itzhak Perlman at the Brooklyn Conservatory, where he obtained a Master’s Degree of Arts under his tutelage. He was awarded the Presidential Scholars Award from the Council of the City of New York for his merits as a violinist and his academic work. Shortly after he toured the US with chamber music ensembles (The New York Players, The Masterplayers), and performed as a soloist with orchestras in Switzerland and the United States. Resident of Montreal, Canada since 1980, Helmut Lipsky established here his creative musical platform, the MELOSPHERE with a consortium of outstanding musicians, with which he still collaborates today on a multitude of projects for the stage, CD, television, radio, film, multimedia, theatre and dance productions. Lipsky is very active on the national and international music scene as a violinist, composer, improviser and teacher in the realms of classical music, jazz, tango, world and contemporary music. 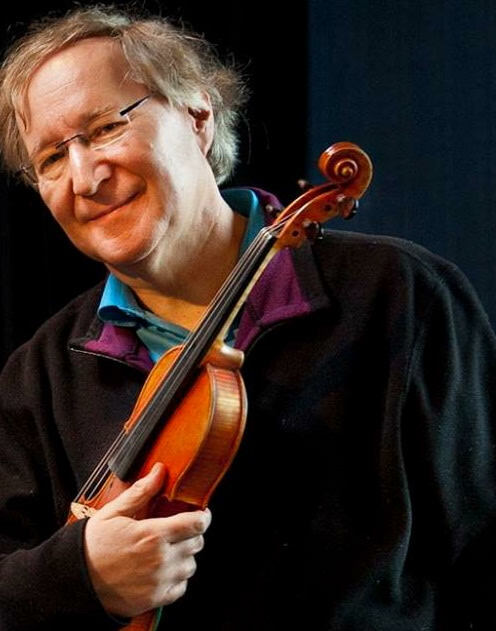 He has taught at several universities and colleges – including Université de Montréal, McGill and Concordia University – and is now professor at the Conservatoire de musique de Montréal for violin, chamber music and string improvisation. During the summer, he has taught, among other summer schools, at the Domaine Forget International Festival, the Camp musical des Laurentides, Camp musical de Lanaudière, the Thüringische Sommerakademie in Germany as well as the Interharmony – Sulzbach-Rosenberg International Music Festival and the Interharmony International Music Festival in Italy. In the summer of 2016, he cofounded the ground-breaking Clazz International Music Festival, where classical music, Jazz, crossover styles and improvisation are being taught side by side. Many of Lipsky’s former students have distinguished careers as performers and/or play in major Symphony Orchestras around the world, founded or are members of renowned ensembles in a variety of musical genres or participate in Cirque du Soleil productions. As violinist and composer, Helmut Lipsky has recorded many radio and television programs and has participated with his own ensembles – mainly under the name MELOSPHERE – at numerous important festivals in North America, as well as touring regularly in Europe, where he performed with his group, among many other venues in Berlin, Bruxelles, Budapest, Zurich, Milan etc. and as part of the prestigious “New Jazz” Series at the Montreux International Jazz Festival. A regular participant at the Montreal International Jazz Festival, he opened with MELOSPHERE shows of artists like Miles Davis, Dave Brubeck (Lanaudière International Music Festival), Stéphane Grappelli (Québec International Music Festival) and Toots Thielemans (Royal Palace of Brussels). He has also written music for cinema, presented at and winning top prizes in Festivals around the world, the theatre, dance productions and multimedia exhibitions. Known for his eclecticism, he was asked to write original works for special events, like his Harbour Symphony for violin, ship sirens and church bells performed at Montreal Harbour or his Concerto for Violin and Chainsaw as the opening concert of the Third International Art Symposium in Abitibi-Témiscamingue, Québec, Canada. In December of 2015, he collaborated with the Swiss composer Thomas Fortmann at writing the music, and performing for the Memorial Concert “Grafeneck 10654” for the Euthanasia victims of the Castle Grafeneck in Germany. These works were presented again in Montreal in November of 2017, sponsored by the General Consulate of Germany. His duets for two violins “Voyage à deux” Vol. 1 and 2 and various chamber orchestra works are very popular with students and professionals of any age group and are being played around the world. Helmut Lipsky recorded many critically acclaimed CDs under his and his ensembles’ name and has collaborated with renowned artists like Andreas Vollenweider, David Darling, Angèle Dubeau and her ensemble La Pietà, Jeremy Cohen’s Quartet San Francisco, André-Gilles Duchemin, Gilles Vigneault, Claude Léveillé, Karen Young, Michel Donato, James Gelfand, Matt Herskowitz and François Richard on various projects. He has won several prestigious awards, among others the coveted Prix OPUS for his album Helmut Lipsky – MÉLOSPHÈRE – Tempi con Variazioni, featuring the distinguished soprano Suzie LeBlanc in 2011, and First Prize at the International competition of the worldwide community of French language radio stations. Proclaimed member of the “Ordre de la musique française”, he was three times nominated for Best Album at the Felix Awards, twice for Best Concert of the Year by Les Prix OPUS, Best Violinist by the National Music Awards and was invited several times as Performer-Presenter at the prestigious Idea City Conference of Moses Znaimer in Toronto. Helmut Lipsky has received several funds from the Canadian Arts Council and the Quebec Cultural Ministry. Since the summer of 2017, he is now also a member of the popular ensemble Quartango, which has recorded many albums, has won several important prizes (among others a Juno Award and OPUS Prize for Best Album) and has toured internationally.